Honestly, this is the definitive moment of the game. Hat tip to Dustin Parkes at The Score. Moving the Needle: Jacoby Ellsbury ties the game in the ninth, +.417 WPA. If you’re going to watch an archived game, or even a condensed game, may I suggest this one. It had a little bit of everything. On the downside, it had rain. But there was more than enough upside. The Red Sox didn’t pick up their first hit until the seventh inning, while neither team scored until the top half of that inning. 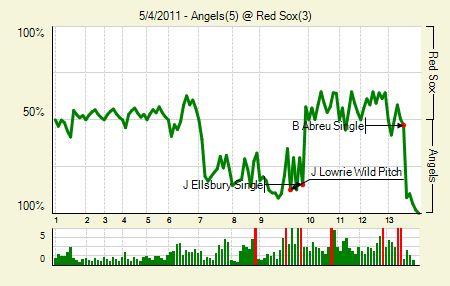 The Angels took a 3-1 lead into the ninth and blew it, and a crazy play factored in heavily. And then there was some extra inning gold. I think I need another paragraph to describe it. A walk and a hit by pitch were Ervin Santana’s only blemishes through four innings. Unfortunately for him, the rains came to Boston and they had a lengthy delay, far too long to even consider putting him back in. That left the job to Rich Thompson, who pitched two hitless innings of his own. But with one out in the seventh, then facing Scott Downs, Jed Lowrie picked up a single. Nothing came of it, but something did the next inning when Jason Varitek doubled off of Fernando Rodney. Oops. Adrian Gonzalez knocked him in, cutting the lead to one. 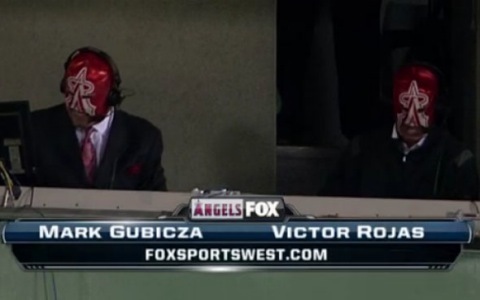 The Angels added one in the ninth, which they really, really ended up needing. Lowrie walks to open the ninth, and Mike Cameron singles him to second. Here’s where reading the play-by-play might not fully explain everything. Jordan Walden delivered a pitch in the dirt, and Hank Conger couldn’t keep it in front of him. The runners tried to advance, and Alberto Callapso couldn’t handle the throw. It kicked off him and towards Erik Aybar at short. Lowrie took off for home and would make it easily, but the same couldn’t be said for Cameron. The Angels cut him down at third, leading to the largest negative WPA swing of the game, -.221 (because even though a run scored they needed another one and now had no runners on with only two outs remaining). Carl Crawford, who was at bat during this fiasco, ended up doubling and then scoring on Ellsbury’s single. In extras the Red Sox had the walk-off run in scoring position in both the 10th and the 12th, but failed to bring him home. That opened the door for the Angels in the 13th, as they loaded the bases for Bobby Abreu, who singled past a diving Dustin Pedroia and put his team ahead by two. I don’t do this a lot, but this was seriously worth the effort. Ervin Santana: 4 IP, 0 H, 0 R, 1 BB, 7 K. Of all the starts to get shut down by rain. Hank Conger: 3 for 4, 1 2B, 1 BB. On base four times and he neither scored nor drove in a run. Daniel Bard: 2 IP, 1 H, 0 R, 1 BB, 4 K. Some nice relief work to keep the game knotted at zero. Moving the Needle: Juan Pierre flies out to end the game, -.178 WPA. Poor JP. First he gets picked off after singling in the first, and then he flies out with a runner in scoring position to end the game. The highest positive WPA swing of the game? When Matt Capps hit a batter, putting that runner into scoring position. The Twins biggest swing? A ground ball single that put them up 3-1 in the sixth. I didn’t catch any of this one, but it sounds like a ho hum game. Thoughts from those with the eyeballs on it? Alex Rios: 3 for 4, 1 HR. He’s 6 for 19 with three homers in his last five games after a putrid start. Denard Span: 2 for 3, 1 BB. He scored two of the Twins three runs. Moving the Needle: Martin Prado comes through with a baes-loade single, +.143 WPA. This game didn’t get really out of hand until the sixth, when the Braves loaded the bases with one out and then rallied for four runs. Before that they were stuck in a 2-2 tie. Well, for a few batters, at least. They had the bases loaded and one out here, too, but managed to plate just two when Prado slapped one past Rickie Weeks. Prado added two more singles in the game. Tommy Hanson: 6 IP, 3 H, 2 R, 2 ER, 2 BB, 7 K, 1 HR. It took him over 100 pitches to complete six, so his night was over. But the Braves bullpen had his back. Nate McLouth: 2 for 3, 1 2B, 1 BB. He was also notable in the second half, so scroll down for his recent trend. 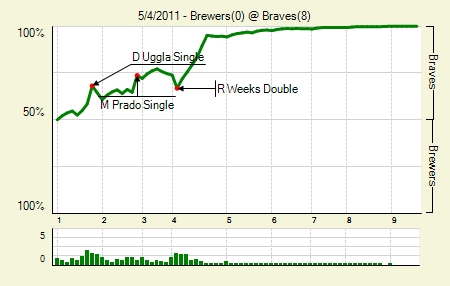 Moving the Needle: Dan Uggla opens the route with an RBI single, +.096 WPA. The Brewers were down and out in the first half of this doubleheader, but they had their presumptive ace, Zack Greinke, going in the second one. But he showed his rust early on, leaving a few pitches over the plate. which led to five runs through four innings and a short night for Greinke. Uggla got things started with an RBI single in the first, but that was as far as the needle would move. The Braves constant assault whittled away at the win expectancy little by little, until it was all the way up to 95.2% in the fourth. Uggla himself went 3 for 4 with a double and a walk, essentially giving the middle finger to Matt Klaassen. Tim Hudson: 9 IP, 1 H, 0 R, 1 BB, 6 K, 15 GB. When Huddy’s on there is no stopping him. I can’t be the first person to point out that I’d far, far, super duper rather have this start than Francisco Liriano’s no-hitter, right? Nate McLouth: 2 for 2, 1 HR, 2 BB. He’s 19 for his last 56 with five doubles, two homers, and 12 walks. 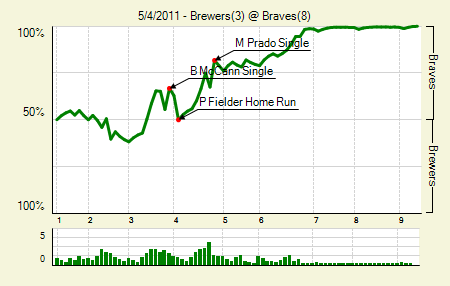 Moving the Needle: Magglio Ordonez gets hotter with a homer, +.127 WPA. That one must have felt good for old Maggs. Not just because it was his first homer of the season, but because it was a pretty authoritative shot. 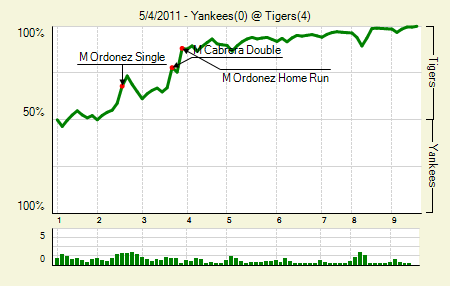 The blast gave the Tigers a 4-0 lead, which, since the Yankees have caught White Sox disease, all but assured victory. It was his only hit of the game for Ordonez, but it was his third in the last two. We’d have to go back to April 24th to find his three hits prior to that. Max Scherzer: 8 IP, 4 H, 0 R, 2 BB, 9 K. I’m frankly surprised he gave up even those four hits. Miguel Cabrera: 1 for 3, 1 2B, 1 BB. The walk was intentional, and a long time coming for a guy who has pulverized the Yankees this season. His double also drove in the game’s second run — or, as it were, the first unnecessary run. 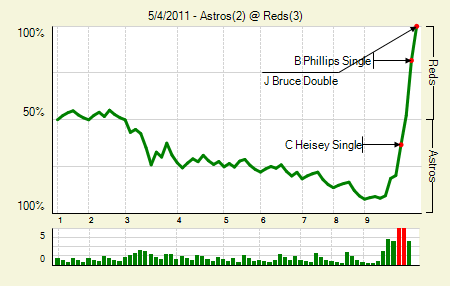 Moving the Needle: Brandon Phillips singles home the tying run in the bottom of the ninth, +.294 WPA. Sometimes it takes just one swing to turn a deficit into a walk-off win. In this one the Reds needed a couple. They came into the ninth down two, just a 9.4% chance of winning the game. A walk, wild pitch, single, single, single, and, finally, a double, ended the game and avoided a second straight loss to Houston at home. Phillps’s needle-moving single was the last one in that list, right before Jay Bruce’s game-ending double. Aneury Rodriguez: 5 IP, 1 H, 0 R, 1 BB, 3 K. Not bad for his first major league start. He had eight relief appearances earlier this year. J.R. Towles: 1 for 3, 1 2B, 1 BB. Now hitting .361/.465/.611 in 43 PA this season. Moving the Needle: Mike Aviles sets up a potential comeback in the eighth with a double, +.167. 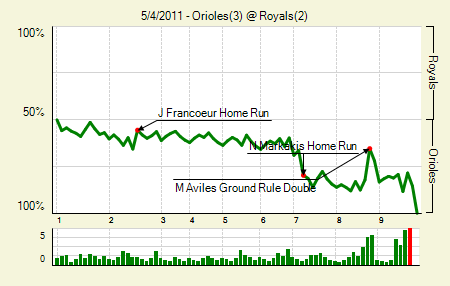 The 2-1 Orioles lead lasted from the second until the seventh, when they tacked on another. The Royals then mounted something of a comeback attempt in the eighth. Aviles’s one-out double put runners on second and third with one out, which set up Melky Cabrera to drive one in on a grounder. That cut the lead to one and gave the Royals life in the ninth. But with a runner on second and two outs, Kila Ka’aihue flied out, ending the game. Nick Markakis: 2 for 5, 1 HR. He drove in two of the Orioles’ three runs. Jeff Francoeur: 1 for 3, 1 HR, 1 BB. He walked in the ninth and actually took second tagging from first, which was the only reason Kila hit with a runner in scoring position. That was Frenchy’s eighth homer on the season. He has a .420 wOBA, which is just mind blowing. Moving the Needle: Geovany Soto opens the scoring in the fifth with a homer, +.162 WPA. 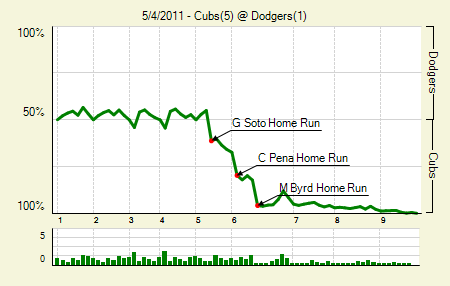 This game went from back-and-forth zeros to an all-out assault by the Cubs in the middle innings. It started with Soto’s homer, a blast off a Ted Lilly meatball. The Cubs would then tack on four more in the sixth on the strength of two homers, putting the game out of reach. Marlon Byrd: 1 for 3, 1 HR, 1 BB. His three-run blast put the seal on this victory. Carlos Zambrano: 8 IP, 5 H, 1 R, 1 ER, 1 BB, 4 K, 0 HR. A nice performance to be sure, but it’s not as though the Dodgers are lighting up scoreboards. He has only 10 K in his last 19 IP. 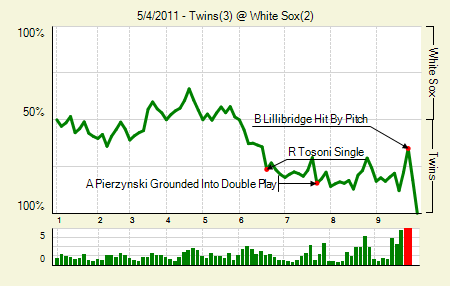 Moving the Needle: Ben Zobrist grounds out with the tying run on third in the ninth, -.188 WPA. Sorry, Zorilla, but that’s the way the WPA breaks in this game. 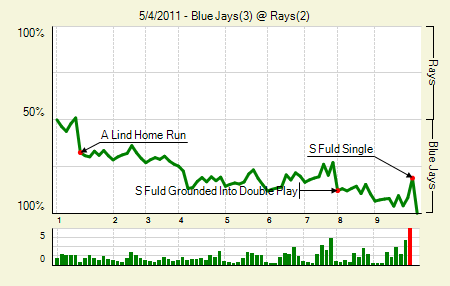 The Rays had runners on first and third in the ninth but just couldn’t bring home that tying run. The Jays got their biggest boost from Adam Lind, who socked a first-inning, two-run homer that added 18.5% to their win expectancy. He went 4 for 4 in the game, raising his triple slash to .316/.349/.513 and his wOBA to .370. That’s some fantastic news for the Jays, especially after his inept start. Brandon Morrow: 6.1 IP, 5 H, 1 R, 1 ER, 4 BB, 7 K, 8 GB. It’s not so much the wildness itself that dooms Morrow — he gets some grounders and strikeouts to help mitigate those walked batters. But it often prevents him from going deeper into games. 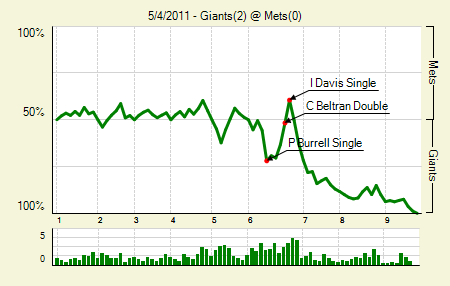 Moving the Needle: Pat Burrell breaks the scoreless tie in the sixth, +.162 WPA. A nice little pitching matchup last night, but the Giants clearly had the advantage. They finally broke through in the sixth when Burrell yanked a single between third and short, scoring Mike Fontenot — No. 3 hitter Mike Fontenot — from second. Fontenot added an RBI single in the next inning. Tim Lincecum: 7 IP, 5 H, 0 R, 3 BB, 12 K. He struck out the final five batters he faced. That’s his third 10+ strikeout game this season. Aubrey Huff: 3 for 4, 1 2B. A nice performance amid a poor start for Huff. 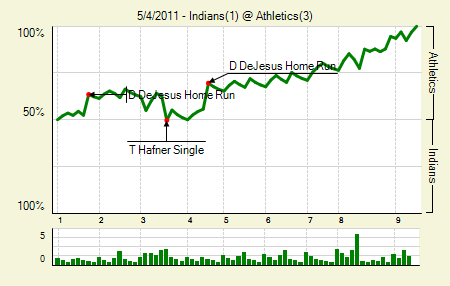 Moving the Needle: David DeJesus hits his second homer of the game, +.139 WPA. It was a night when DeJesus fended off the Indians almost by his lonesome. He smacked a solo shot in the first inning to give his team a 1-0 lead, and then, after the Indians tied it in the third, he added another one, which was all the A’s would need. They’d add some insurance in the eighth just to be sure, but that was just a precaution. They had this one handled, which is something not many teams can say when playing the Indians this year. Josh Tomlin: 7.2 IP, 3 H, 3 R, 2 ER, 0 BB, 5 K, 2 HR. Really, those solo homers were the only blemishes. If his offense had helped him out this could have easily been a win. Trevor Cahill: 7 IP, 5 H, 1 R, 1 ER, 3 BB, 5 K, 0 HR, 16 GB. Can anything stop the Cahill? I’d like to see them try. Moving the Needle: Raul Ibanez continues his breakout, homers in the fifth, +.148. This one was absolutely murdered. I’ve seen Ibanez do something like this in person, when he hit one way up into the bleachers at Yankee Stadium. It’s really a sight to behold. 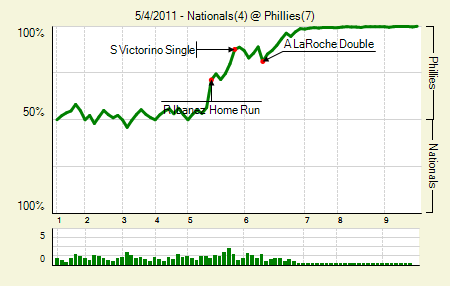 In this one it gave the Phillies a 1-0 lead in the fifth, which they’d build on later in the inning. They piled on even more in the sixth, putting this one out of reach. Ibanez went 3 for 4 himself, continuing his resurgence following an early season slump. Vance Worley: 6 IP, 4 H, 1 R, 1 ER, 0 BB, 7 K. He also had an RBI single at the plate. My Phillies fan friends were swooning over this guy last night. Danny Espinosa: 1 for 4, 1 HR, 1 HBP. His three-run shot came a bit too late, but it was still good for his third of the year. He’s slumped a bit after a hot start. Maybe this gets him started again. 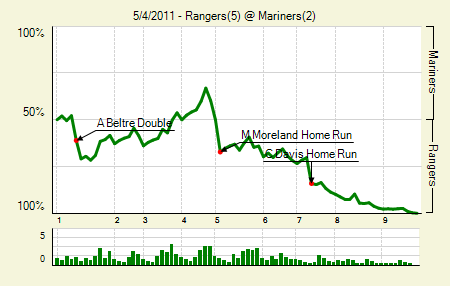 Moving the Needle: Mitch Moreland homers to break the tie, +.172 WPA. Dear Michael Pineda: Don’t do that. The rookie left one right over the heard of the plate, and Moreland sent it way out to right, giving the Rangers a 3-2 lead. Pineda did struggle at times in this one, but he still managed to last seven innings and strike out nine, so it wasn’t all bad. But it was enough bad that the Mariners didn’t have much of a chance. C.J. Wilson: 9 IP, 6 H, 2 R, 1 ER, 1 BB, 12 K, 0 HR, 12 GB. How are you supposed to compete against that? This was Wilson at his most dominant. Chris Davis: 1 for 4, 1 HR, 2 K. Yep. Some players just don’t change. Moving the Needle: Mike Stanton crushes a homer to give the Marlins a lead in the ninth, +.424 WPA. After this season someone needs to compile a montage of Stanton’s homers. And not just the homers themselves, but the outfielders’ reactions to them. This one was big in distance, and big in importance. It broke a 6-6 tie in the top of the ninth, sending the Marlins to victory. 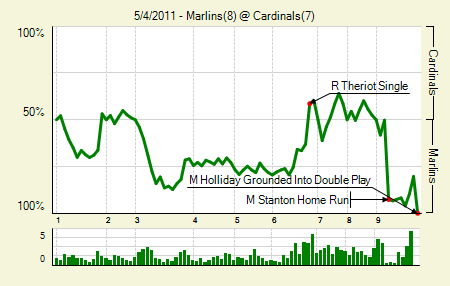 The Cardinals did make it interesting, though, when Jon Jay went deep to cut the lead in the bottom half. But hey, Leo Nunez had it under control all along, alright? Allen Craig: 1 for 3, 1 2B, 1 BB. Doing his part to help the Cardinals replace David Freese. Hanley Ramirez: 1 for 3, 2 BB. He scored all three time she was on base. Moving the Needle: Neil Walker drive in two with a bases-loaded single, +.120 WPA. 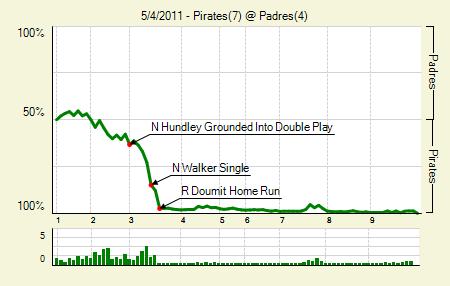 The Pirates had a 1-0 lead heading into the third, and then got something going by loading the bases with just one out. Walker then lined one to center, allowing two runs to cross. Two batters later, following a walk that re-loaded the bases, Ryan Doumit homered, making this one a snoozer pretty early. Even the Pirates pitching staff had little trouble holding on in this one. Matt Diaz: 2 for 5, 1 2B. It’s not exactly notable, per se, but nothing really stood out about this game other than Doumit’s granny. Diaz on here because it was a quality showing amid a horrible start. Brad Hawpe: 2 for 3, 1 2B, 1 HR, 1 BB. Vintage Hawpe right there. Moving the Needle: Chris Iannetta homers, +.209 WPA. There’s nothing better than a homer that is both functional and aesthetically pleasing. Iannetta’s fourth-inning shot off Barry Enright was absolutely both. With the game tied at one, he turned on a Barry Enright pitch and sent it screaming through the Arizona air, lining it off the back of the bullpen in the left field corner. If it were any lower it might have, cartoon style, carried a would-be catcher along with it. It was all part of a Colorado middle-innings assault that put them way ahead, and gave them enough cushion to survive a ninth-inning rally by the DBacks. Jhoulys Chacin: 7 IP, 3 H, 2 R, 2 ER, 4 BB, 6 K, 2 HR, 10 GB. Solo home runs are always more forgivable. It’s really hard to not like Chacin right now. He has the combination ground ball + strikeout that can lead to some special stuff. Also, he has an awesome name. 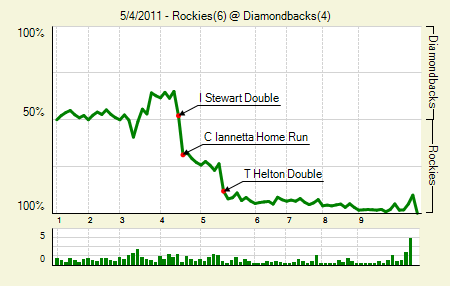 Todd Helton: 1 for 3, 1 2B, 1 BB. He’s off to a highly productive start, .313/.370/.506 in his first 92 PA.
We hoped you liked reading The Morning After: Game Recaps for May 4th by Joe Pawlikowski! What’s Wrong with Yovani Gallardo? Slight correction on McLouth’s line from the Braves’ first game; he was actually 3 for 3, making him a beastly 8 for 8 on the day. Uggla went 5 for 5 w/ 3 BBs. Reached base in all 8 PA’s. Yes, McLouth, not Uggla, did that, a typo on my part.